This two mile segment of the Royal River in North Yarmouth is one of the most popular stretches of the Royal River Water Trail. Begin at Wescustogo Park and paddle downstream to Old Town House Park, or put in downstream and paddle up. Both parks have developed hand carry boat launches. Depending on water levels and paddling skills this segment can be paddled in either direction, allowing a round-trip adventure without the need for a car shuttle. This segment of the Water Trail is popular for kids and has a very gentle current. This river segment is typically maintained by paddlers to stay clear of fallen trees, though caution is always necessary. 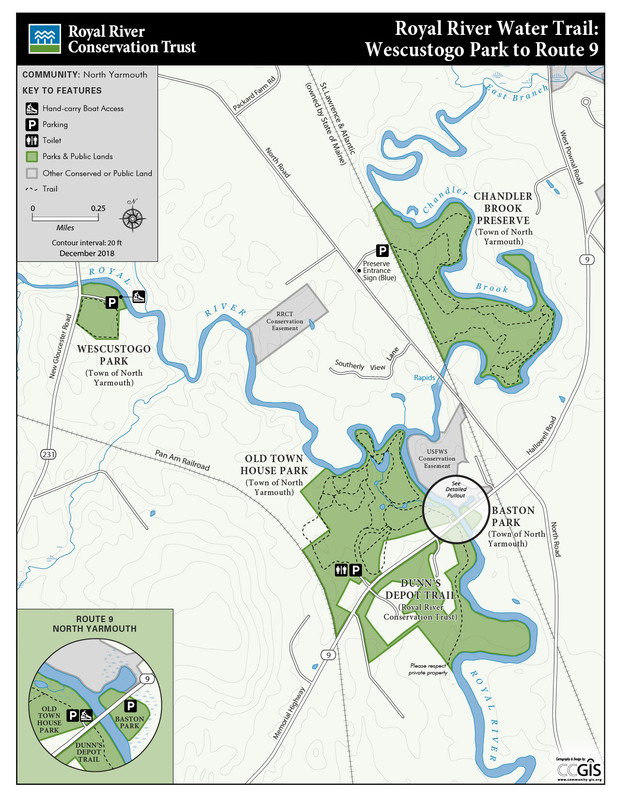 The lower-most reaches of Chandler Brook can be paddled upstream and back by starting and ending on the Royal River boat launch at Old Town House Park in North Yarmouth. From the boat launch just off Route 9 paddlers can make their way upstream to Chandler Brook and the Chandler Brook Preserve. From the boat launch make your way upstream to where Chandler Brook meets the Royal River. Head upstream about a mile, past the Chandler Brook Preserve, until you will most likely encounter downed trees that will make the river impassable beyond that point. Strainers block upstream travel prior to reaching Milliken. Beginning a Route 9 there is no current as you head upstream with the exception of minor rips under the North Road Bridge. The bridge creates a short rapid that can be waded upstream at most water levels or paddled or poled or lined upriver at some levels. Chandler Brook has steep slopes and fallen trees that limit any additional paddle trips.